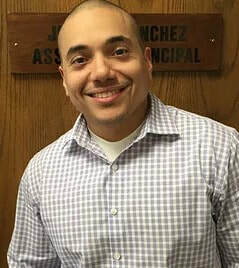 Juan Sanchez - STEER FOR STUDENT ATHLETES INC.
Juan Carlos Sanchez attended Iona College and received a Bachelor’s Degree in Elementary Education. After completing his undergraduate degree, Juan applied and was accepted into Iona College’s Hagan School of Business where he started his Master’s in Business Administration. While working on his MBA, Juan began working as a school counselor at Cardinal Hayes High School in Bronx, New York. Working as a school counselor, Juan fell in love with the profession and wanted to devote his life to helping adolescents realize their potential and achieve success in their post secondary studies and beyond. That passion lead him to obtain a Master’s Degree in School Counseling from The College of New Rochelle. After four years at Cardinal Hayes High School, Juan was given an opportunity to work at Port Chester High School where he has been for the past nine years. Sports have always played an important part in Juan’s life. As a young adolescent, he was actively involved in the handball, cross country, and bowling teams at his high school. Through sports, he learned important life lessons such as humility, commitment, sportsmanship, and leadership. That competitive fire still endures many years later as Juan is an avid long distance runner and most recently completed the New York City Marathon.